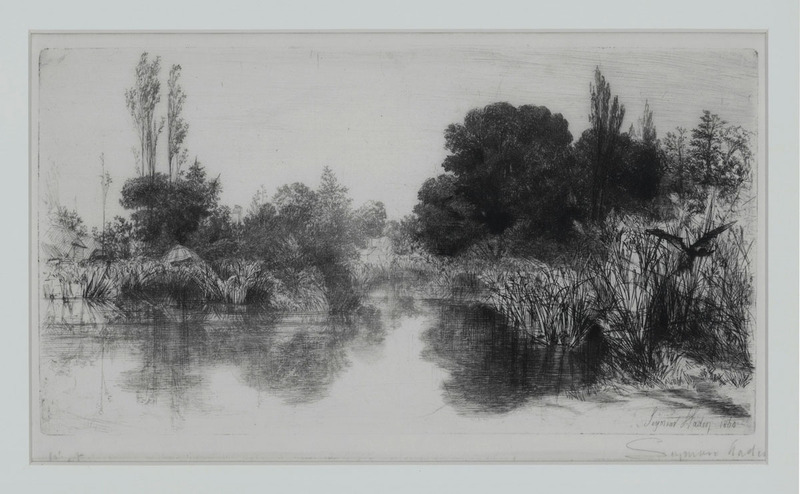 A beautiful etching by Sir Francis Seymour Hayden measuring 7 x 13 inches, pencil signed on l.r., Schneiderman cat: 37, state VI/IX, 1860, printed on japan paper, label from Harlow and McDonald included. Sir Francis Seymour Haden was one of the most important British etchers of the 19th century, along with his brother in law, James Whistler. In addition to being a highly regarded artist, he was a successful surgeon, accomplished author and dedicated angler. He was a founder and the first president of the Royal Society of Painter-Etchers and Engravers, and was knighted in 1894. This print was exhibited at the Royal Academy in 1861, under "H. Dean," the anagram of Haden.